Nerd Words Science is a word game where the words are about, you guessed it, science. Having a background in both science and words (although after reading this review, you might wonder if the latter is actually true), I was interested in giving it a try. Depending on your player count, Nerd Words is played in 2 to 3 teams. During the game, you will either be giving clues for a science term, or working with your team to guess it in under a minute. When you’re the clue giver you will be choosing a science term from your card and providing clues to get the other players to guess your term. Here’s the catch: the clues that you give have to start with a letter in your science term (but not the first letter). For example, if your term is “melting point”, maybe your first clue is “temperature”. Can you guess the science term? See the last photo to find out. If no one gets the right answer, the clue giver will repeat these steps: write, bet, wait for guesses. If the players need a fourth clue, it works a little differently. This final clue must begin with the same letter as the science term and the clue giver does not bet any points. As a team you will be guessing a science term that contains the starting letters of all of the clues that have been given. In games I’ve played, if someone has an idea they write it on the scorecard and the teammates nod or quietly discuss whether or not they think it’s good. You don’t want to have too much discussion about your answers because you don’t want the other team to get any hints from you. After each clue is revealed, teams will get 1 minute to write down their guess, as well as a bet if you think you have the right answer. If you get it right, you will get the points you bet (generally between 0 and 4) and points based on the clue that you guessed on (4 if you were correct after clue 1, decreasing down to 1 after clue 4). The game will end after a round where a team reaches 49 points or after all players have been the clue giver either once or twice depending on player count. Something I’ve noticed about Nerd Words is that people feel a bit overwhelmed when they first hear the rules for clue giving. The fact that you have to give a clue that starts with one of the letters of the term intimidates people, but it’s also what makes the game fun and different. Having this restriction on the clues that you can give forces the clue giver to think creatively. When you do manage to find a clue for a term that was giving you trouble you feel a similar satisfaction to the one you get from linking two seemingly unrelated words in Codenames. Another common fear that people have is that they don’t know enough about science. It turns out that this really isn’t much of a problem. None of the terms are so outrageously scientific that no one on a team will be able to get it. 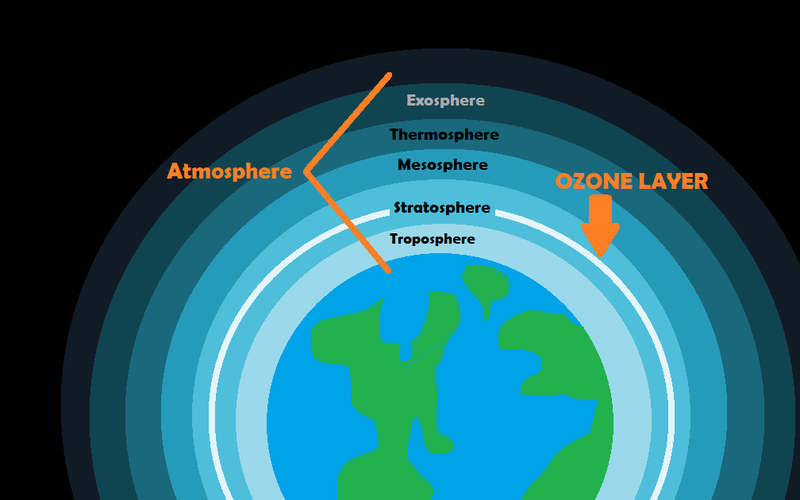 In fact, if you know too much you might run into a similar problem as me where you guess stratosphere instead of atmosphere because it’s more scientifically correct. Oops. Nerd Words is a good game for large groups of people. Unlike some games, where a central playing area needs to be viewed by all players, it was really easy for a group to play this game on some couches. Normally, I don’t love playing on couches because of awkward leaning and difficulty reaching pieces, but the way Nerd Words works only requires that teams are able to huddle and work together. This is a perfect game for a comfy spot. Earlier you may have noticed that I said you can bet 0 to 4 points on your answer being right. There is a caveat where if your team is losing, you can bet up to half your points. While it’s nice to have a catch-up mechanic, I did find this to be a little overpowered. In one game I played, the losing team bet 20 points that they were right. Both teams were sure of their answers, but because one team was 5 points behind they could make a bet that ensured that they would win. Sure, there was the chance that they would then lose 20 points, but in some cases the answer is very clear. This is something I think should be reconsidered. As far as components go, I will say that I got a prototype, so what I was playing with may not be reflective of what Kickstarter backers get. That being said, I have a few minor complaints about the components, mainly the scoreboard. Teams start with 6 points, which isn’t the most intuitive number, so it would be nice if there was some indication on the scoreboard that this is the starting space. A larger spot or a coloured background would work well. It would save players a tiny bit of hassle in the setup and I think that’s a valid enough reason. The choices for the score markers could also be improved. There are three options: pink, black and dark blue. When you only have three pieces it would be good to have a bit more distinction between player pieces. The blue and the black could easily be confused in the wrong lighting. All the score markers can’t even fit on the starting space, it could be bigger. Something that I find really telling about Nerd Words is that people want to keep playing after it’s over. Players will keep talking about the clues they would have given even with no points on the table. They’ve been thinking of their clues and weren’t ready for the game to be over. I think that’s a really good sign. 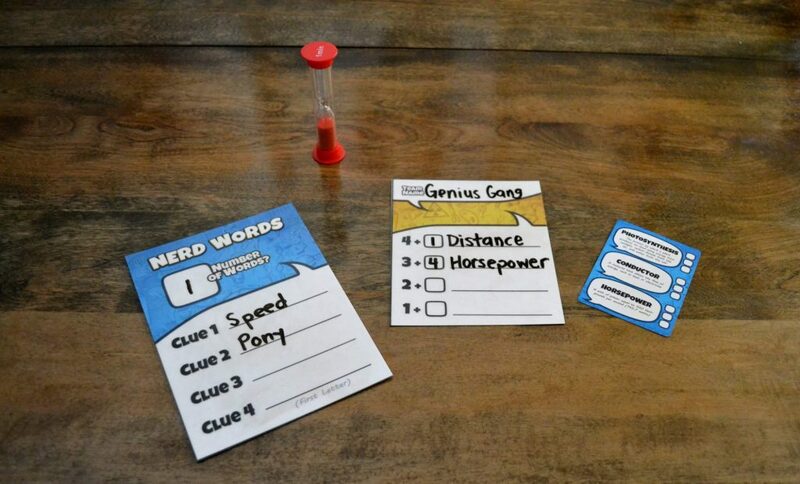 Nerd Words is a smart party game, both in theme and design. You get to work as a team, while sitting comfortably and having some good laughs at the silly mistakes your friends make. But don’t take my nerd word for it, go check out their Kickstarter for yourself! Previous postGartenbau Review: How Does Your Garden Grow?